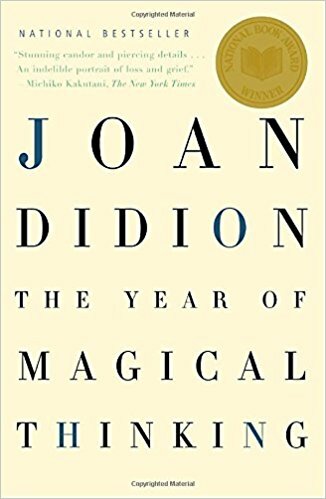 Joan Didion's The Year of Magical Thinking is a portrait of grief during the year following her husband's death. She pinpoints the vagueness and totality of grief accurately and beautifully (based on what I experienced), cataloguing her unwillingness to throw out the last of her husband's shoes, for the wish that he would somehow one day return. This book encourages inward thinking, self healing, and offers a perspective with distance - a perspective that illuminates what truly matters in life... As Joan writes, life can change in an instant. "We have no way of knowing that the funeral itself will be anodyne, a kind of narcotic regression in which we are wrapped in the care of others and the gravity and meaning of the occasion. Nor can we know ahead of the fact (and here lies the heart of the difference between grief as we imagine it and grief as it is) the unending absence that follows, the void, the very opposite of meaning, the relentless succession of moments during which we will confront the experience of meaninglessness itself." At the same time that her husband died, Joan Didion's young adult daughter was in the ICU, in a coma. This combination of trauma is baffling and The Year of Magical Thinking is Joan's attempt to piece it all together, to swallow and face the drastic upheaval that occurs.